Many people believe that the cause of the dark colorations on the roof come from jet airplanes bombarding their roof with toxic jet fuel. This is simply not true. The black coloration actually comes from photosynthetic cyanobacteria consisting of algae spores known as Gloeocapsa Magma. It feeds off of the limestone used to make both asphalt shingles and concrete roof tiles. These spores thrive in wet conditions and humid climates. This is one of the reasons that it is more prevalent on the north and west sides of the roof. These areas tend to be wet longer in the morning which allows the spores to thrive. There is no scientific proof that these spores have any major impact on your health although this is commonly advertised from roof cleaning companies. Some have gone as far as scare tactics. This is not necessary. It is however proven that the spores can absorb heat and reduce the ability of your roof to reflect the sun’s rays. The effect can cause your attic to absorb more heat and raise your electricity bill from you’re air conditioner working harder to keep your home cool. They can also have major effects on tarpaper and wood shingle surfaces. If left untreated the spores can retain more moisture and as they grow can start to breed lichens. They can root into the surfaces often causing granular loss to asphalt shingles or wood rot to cedar shake shingles. Finally most Home Owners Associations have strict rules on roof cleaning. On average they only allow a homeowner a maximum of three years between cleanings. Do you choose Chemical Cleaning or Pressure Cleaning? Who’s Right? A common misunderstanding is that all roofs are created equal. There are too many factors for this to be true. You have to consider that not all roofs are made of the same material. You have metal, shingle, wood shingle, tile, and metal tile roofs. Many roofs are very hard to traverse due to varying pitches and materials. This makes for a very dangerous business to have a one solution method. 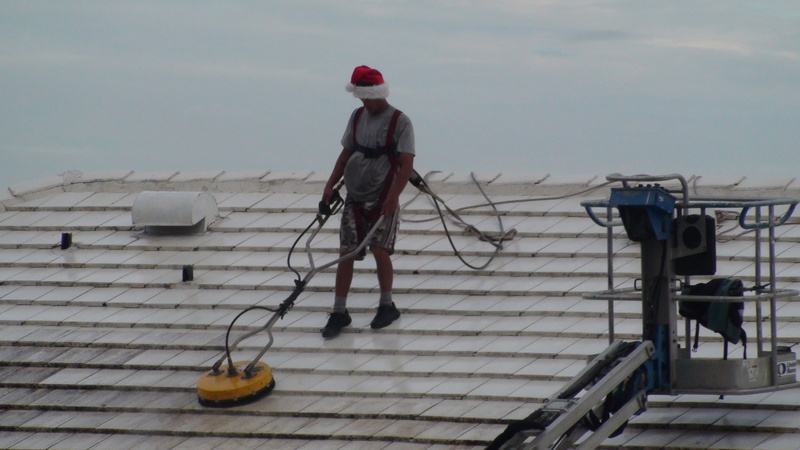 Some companies believe there is a single solution for roof cleaning and have adopted this method. This is the use of extremely potent chemicals sprayed on in massive quantities. This makes the algae stains on the surface magically disappear. In the 1980’s when many roofs were shingle the chemical solution was the widely accepted solution. This was due to damage to the shingles from pressure cleaning causing granular loss. That fact is still true, shingle roofs cannot handle pressure cleaning. Shingle roof owners do not have a choice. If the process is done correctly by chemical cleaning the contractor is able to prevent extreme granular loss. Any chemical process should always be rinsed from the roof. The longer you leave any chemical on a roof the more damage it is doing. Never have a company mislead you to believe that the longer a chemical stays on your roof the more it is helping or that it will extend the cleaning. These are called spray on leave on methods. Many roofing materials are prone to rust and other cellular damage from excessive exposure to chemicals. This can include nails, flashing, tar paper, shingles, and other building materials. As for tile roofs chemical cleaning is not the best solution. In fact it is the opposite, although this practice has been adopted across the board. The strength of these chemicals has to be so high with no dilution available for these processes to work. These chemicals can get caught in cracks and crevices for long periods of time under the tiles. This is especially true where you have tiles butting together in valleys. Many of the new building codes in the state of Florida require you to foam fill air space under the tiles for hurricane protection. This allows more areas where chemical can get caught and also allows more roofing products to be exposed to chemical damage. 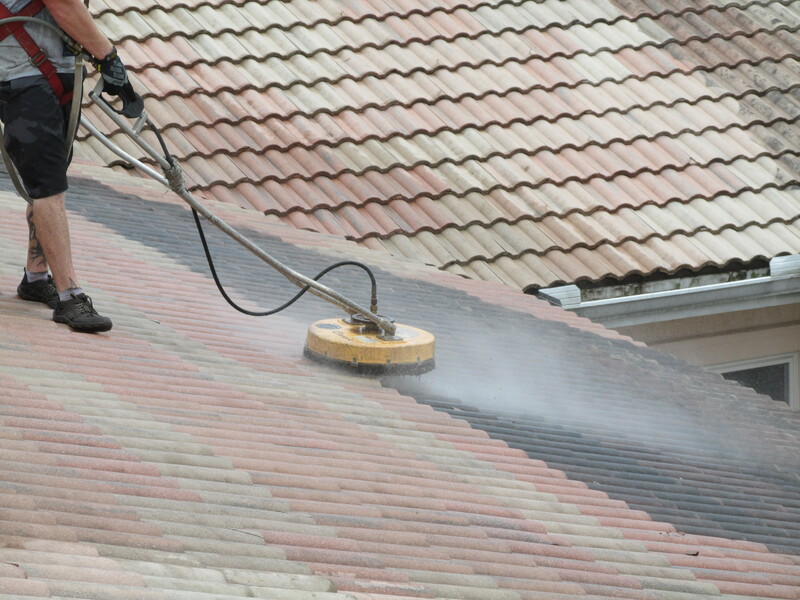 The use of chemicals is necessary in cleaning all forms of roofs including tiles. The right type of contractor will use less than 5% of the chemicals that (chemical only) type companies may use. This is accomplished by having an appropriate mix of chemical and agitation from pressure washing. It is a common known fact in any form of cleaning that chemicals are more effective with agitation. For this reason companies that pressure clean tiles do not have to service their contracts as often as (chemical only) spray companies. Many chemical only companies have to spray repeatedly throughout the year. For the average 2000 square foot home they usually charge fees of $75-$100 per visit and usually revisit as often as twice per year. These prices greatly outweigh standard pressure cleaning of tile roofs. Most pressure cleaned tile roofs last between 2-3 years but can last as long as 5 years. The average 2000 square foot home is less than $200.00 to pressure clean the tile roof. In three years on a maintenance program this can equal $600-$800 or more for the same period of time. These companies are usually higher in price because they have to pay for large quantities of expensive chemicals. However they should have a counter balance on labor cost because the chemicals do most of the work. Most chemical only companies do not have a way to rinse the roof because the limit of their equipment is a chemical pump, a tank, and a ladder. This also allows anyone to get into this type of cleaning very inexpensively. One of the reasons we tell our customers to investigate any company they will be considering for the job. There are many myths about pressure cleaning that need to be cleared up. Pressure cleaning does not damage tile roofs. It does not peel off a layer or a sealer on a concrete tile roof. Pressurized water cannot exceed the depth of the tile and damage the paper underneath through the gaps between tiles. The joint is not large enough for the water to surpass it. It also cannot break tiles or cause tiles to come loose from the roof. The cost of water for pressure cleaning an average 2000 sq. ft. roof is less than $2.00. Many of these types of companies have the equipment to complete other services easily on your property. Pressure cleaning does not damage homes, irresponsible companies with untrained employee’s damage homes. Most pressure cleaning is done 3-4 feet away from the home. The machine just allows us to speed up the process. Imagine if they were out there trying to clean your house with your garden hose. Good pressure cleaning companies will use properly measured and managed chemicals that will not harm your plants or family. There are so many chemical companies selling all kinds of do- it-yourself products online, at home shows, and trade shows. Many uninformed contractors are buying these same products that you see advertised with no care for the ingredients or the effects. These companies have no experience in roof cleaning and in most cases haven’t been in business for more than a year or two. If a company tells you the roof cleaning chemical is some proprietary magic trick they invented but can’t tell you what’s in it, kindly excuse them and find a new contractor. You should always know what someone is putting on your roof or around your house. Some companies have adopted the practices of spraying undiluted chemicals on other surfaces like sidewalks or home exteriors without even the care to rinse them off. These chemicals can effect vegetation in plant beds or can be tracked into the house affecting your family’s health and wellness. Always beware of the contractors that say their product is green or environmentally friendly. This is a big red flag. The contractor should be able to share his entire process including chemicals used and dilution rates. This will allow you to research his process and make sure it is safe for your property. Some experts will claim that the byproduct of most chemicals is inorganic salts that are not harmful to the environment. Although this is true there are many factors to take into consideration. Chemicals and pesticides can have long lasting residual effects. This has been proven throughout history. There are good companies out there looking for more support from regulatory bodies like the EPA. Their support could help create more guidelines so the consumer could have more concise information when purchasing. In some states they have initiated regulation to force companies to have better practices that adhere to the laws put forth by the Clean Water Act. Many companies claim that their process is approved by the EPA. As a general rule government agencies will never endorse a company or the methods it uses. On the contrary this usually means there method is monitored or scrutinized by either one or multiple government agencies. Some product trade manufacturing associations such as the ARMA (Asphalt Roofers Manufacturers Association) will however recommend the best and safest common practices but will usually be in concise language that the consumer can understand to effectively use the practice themselves. The ARMA currently only recommends a mild solution of mild bleach and detergent. This trade association represents their industry. They provide proper care and maintenance instructions for the products their members manufacture and have to warranty to consumers. Some of the following products can have huge impacts on quality of health for your family, pets, plants, and even the soil your plants live in. Many of these chemicals have to be used at an (undiluted) maximum strength in order to be effective to clean without agitation. At this level of strength these chemicals can cause corrosion of metal surfaces and degradation of the materials that keep your roof in good order. Many companies are spraying chemicals that are classified as pesticides. Some pesticides are heavily regulated by the department of Agriculture and the EPA. They are known for having damaging effects on life, property, and many building materials. We find these practices to be dangerous not only to the occupants of the dwelling but also the operators of the equipment. Feel free to look at these chemicals and pesticides up on Google for more information. Sodium Hypochlorite (Bleach): A strong alkali with a PH of 11. Has disinfecting capabilities. PH ratings of most chemicals are dependent on dilution rates. These two products are made from electrolyzing sulfuric acid with two different metals. When applying any undiluted forms of chemical or pesticides applicators should be in (Tyvek) full body suits, gloves, and have double cartridge respirators on. This is why these methods are harmful to everyone else below the roof line. You, your pets, and your children, do not have this luxury. These chemicals can easily go thru ventilation on homes and buildings or be tracked into the house. All chemicals and pesticides no matter their classification can be very dangerous and can have ravaging effects on skin and internal organs. Toxic exposure can come by contact with the eyes, skin, or inhalation in many cases. The best thing a consumer can do is regulate the people allowed on your roof and be aware of their behavior. The weight of the technician is important to consider. You really should limit people on your roof that are in excess of 225 lbs. (preferably below 200 lbs.) Good companies will teach their employees how to traverse a roof and do minimal to no damage, this requires experience and training. It is important to hire a company that repairs visibly broken tiles with a bonding adhesive upon completion of the cleaning. Broken tiles are not caused by pressure cleaning versus chemical cleaning this is commonly a selling point of chemical sprayers. This claim is not true. Most tiles are made from the same materials in concrete. Be sure that your service is done by a competent contactor with many years of experience in the business. Many broken tiles come from thermal expansion and contraction due to very hot temperatures moving to very cool temperatures repetitively. This is common in many building materials. Remember the tiles are the aesthetic part of the roof they do serve a purpose although the most important part to protect is the tar paper underlayment. This can be accomplished by knowing what chemicals are being sprayed on your roof. In all the years in business I have seen so many product claims it’s hard to sort through them all. My company has done more product trials than you can imagine. Through all of this we have realized there is no solution great to keeping a roof clean. There are companies out there that claim to have sealants that extend the life of the cleaning. Sealers that contain true quantities of solids that create barriers are expensive. The cost for application of these products is roughly between $0.55 and $1.00 per square foot. The only real advantage is that these sealants can block moisture retention and create a barrier with higher reflective capabilities that reduces harmful color fading from the sun. Also if you own a shingle roof you will see less granular loss that comes naturally from weathering. The problem is the cost effectiveness. For the average budgeting family the overall cost of these sealants greatly outweighs there benefits. The application of a sealant does not normally reduce roof cleaning by any great amount of time. Application of such products can usually extend your cleaning to between 7-10 years instead of the usual 2-4 years. The average cost of applying a sealant to a 2000 sq. ft. home is $1200.00-$2000.00. If you took this same home and cleaned the roof every three years, your cost over 10 years (the limit of the sealers life) would be $600-$800. The cost does not outweigh the results when you consider the price of application. Some companies offer a free sealant for the roof with every roof cleaning, which is similar to a carwash offering a free coat of spray on wax. As a general rule they offer no protection and usually won’t last longer than a week or so. There are a lot of misleading claims in roof cleaning. Beware of what you are being sold. Nobody ever likes discussing this issue but it is important that consumers realize the liability they are assuming by hiring a contractor without workman’s compensation. Often customers misinterpret a contractor who is telling them he has insurance. There is a major difference between Liability Insurance and Workman’s Compensation. Most legal companies will carry Liability, for many (owner operators) and small businesses this is a minor expense. Almost as many that carry liability do not carry Workman’s Compensation. This puts property owners at risk of carrying the Liability of someone getting injured on their property. With people being so sue happy it is important to protect your own assets. In the state of Florida the homeowner is responsible for any person doing work on your property without Workman’s Compensation. In some cases the homeowners insurance will take responsibility for the limit of the coverage. Many times this is $200,000 per incident most work related accidents (especially falling from a roof) well exceed this amount. Roof cleaning is a very dangerous business. Most major accidents reported from OSHA involve a ladder or falling from a roof. There is nothing worse than getting involved in litigation you could have avoided. It is important to make sure that they have Liability covering your property and Workman’s Compensation to protect any workers working on your property. Ask for a certified up to date certificate with your name and property address included in the additional insured box. We also recommend that you be careful of recommendations from property management companies and lead generation services. Make sure you verify with them specifically that they are checking for Workman’s compensation. We have recommended to many property management companies to be careful with preferred vendor’s lists. They can easily be involved in unnecessary litigation by referring a company that is putting their homeowners at risk. We are not saying this is not a good thing for both parties. It only takes five minutes on the phone to get certified copies of additional insured. This will make certain the company you are recommending is looking out for the interest of your clients. Protect your life long investment. Many of the companies we bid against are less than a year old. This is easy for consumers to figure out by going to the business filing regulator for your state. In Florida it’s www.Sunbiz.org. The internet has allowed you the ability to find out useful information about a company you are about to hire, like how long they have been in business, current or expired with their filing or if their company even exists. Most searches can be done from the comfort of your office chair. The pressure washing industry is unregulated with contractors having no entity to answer to. This business is full of cash paid employees and owner operators with no experience. It is dangerous to have work done by businesses that have no assets and do not really exist on paper. Professional pressure cleaning companies will have years of experience, trailer mounted heavy duty equipment, uniformed trained employees, and the proper insurance including workman’s compensation.